Castle Vardulon: I'm confused by this webternet ad. 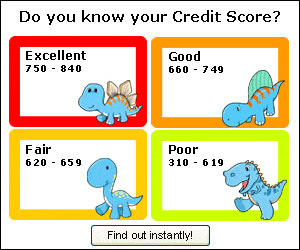 The basic idea is that the relative health of your credit score is indicated by the type and mood of dinosaur in the box. His credit score's a little lower, but still in the good range. He's still smiling, but clearly not as broadly. It's almost as if this one knows he's got an average score. There's no spring in his step. I doubt he has any lust for life at all! Look at the flat expression on his face. He's looking forward and seeing lean times ahead. Now here's where the theme falls apart. 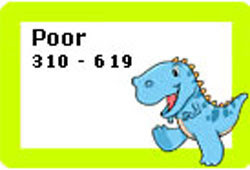 This guy has the worst credit score of all, yet he's - by an incredibly wide margin - the happiest of all the dinosaurs! Is this some kind of a subversive message, pointing out that the only truly happy people are those who don't concern themselves with things as trivial as their credit rating? If so, great job, because when I picture myself as a dinosaur, I picture myself as number four. Well, okay, that's not true, I picture myself as number three, the depressed long-neck, but I wish I was number for, all bounding optimistically across the plains, looking forward to his next fight to the death with a triceratops. Oh, and while I'm talking about credit ratings, I've got to ask - what's going on with credit ratings? What kind of a scale tops out at 840? Also, how fair is it that the top score has a ninety point variance, then second level has another ninety point variance, but to land in the area of having 'fair' credit you've got to fit inside a forty point range? 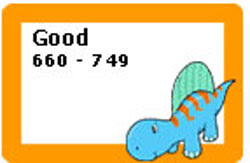 Then there's the bad level, better known as the 'happy dinosaur range'. It's a full 310 points wide! It's so big that I didn't feel like typing it all out! 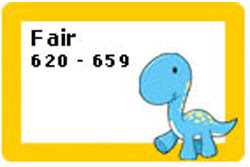 More importantly, though, since they've got 310 points to deal with, couldn't they have lent fifty of them over to the fair range to bring it in line with the top two categories? These numbers are all arbitrary anyways - it's not like anyone would think that the bottom end of the scale wasn't big enough if it was only 260 points instead of 310. And yeah, the scale doesn't bottom out at zero. It's like whoever designed the credit scale was specifically trying to make it impenetrable for the average person to understand. Which would force those average people like me to consult experts in order to tell me my score and explain the meaning of it. You know what? 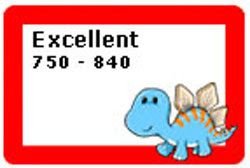 I'm going assume that I'm a happy dinosaur, and just be satisfied with that.